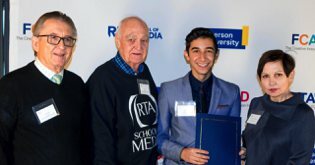 On November 20, 2018, the RTA School of Media honoured it's best at the annual Awards Ceremony at Ryerson University. Two RTA students received the Rho Alpha Kappa Alumni Association Award of $1,600 each - third year student Julia Le Clair, and third year student Jake Benaim. The Rho Alpha Kappa Alumni Association Award is in its 19th year and is made possible by an endowed fund established by the association and administered by Ryerson University. The fund is now in excess of $100,000 and ensures annual student awards in perpetuity. BROTHERHOOD is a intimate and amusing look at fraternity life at Ryerson in the 50s and 60s, the Brothers' commitment to build a legacy and the friendships that endure to this day. BROTHERHOOD is available on DVD. Send us an email if you would like a free copy. In the late 1960's Hal Arthur (President of Rho in 1959), wrote The Early Days of Rho Alpha Kappa - a detailed and light-hearted look at the fraternity life at Ryerson. To receive a PDF of The Early Days of Rho Alpha Kappa - (38 pages), send us an email request. On October 20, 2018, around 40 Rho brothers and friends celebrated 60 years of Rho Alpha Kappa - a fraternity at Ryerson, 1958-1972. Meeting at Oakham House, we had the chance to talk about old times and some of the more memorable moments in life at the fraternity. But most importantly, we remembered what the fraternity represented – brotherhood in the true sense of the word. Rho was a place where like-minded people could come together and get to know each other, not just as acquaintances around school, but as friends in the true meaning of the word. And 60 years later with the annual Rho Alpha Kappa Alumni Association Award, we're able to leave a legacy that will endure long after we're gone. Ryerson fraternity celebrates 60 years.